There's a lot to like about a game like Escape Dead Island where you have no idea what the "eff" is going on. Deep Silver has doubled down on Dead Island to make it its flagship franchise. Since the first game's debut, there's been multiple spinoffs and sequels announced. The one that has my attention the most right now is Escape Dead Island, which is a single player third person action game with a cell-shaded art style. I got to play a bit of it at PAX Prime 2014 and I'm intrigued with how it presented an insane person's struggles to remember just what happened to him. You play as Cliff Calo, who takes a boat to the eponymous island that's rumored to be the source of the zombie infection. The part I played opened with Cliff in a sea of blood red, struggling to make it to his crashed watercraft. Along the way, rocks float up from the water, or plunge from the sky. There are voices speaking to him, and the art style of the visuals lend to the experience not being quite reality. It's not clear if this is a dream or a hallucination or something in between. The combat is in third person, and you can swing a mighty axe to cut down your zombie foes, or aim with a pistol for ranged attacks. The bikini-clad zombies are not always aware of you and that's represented by a large exclamation mark above their heads. Once it turns red and blinking, they have sniffed you out and will being the shuffle towards you, but you can use their reduced awareness to sneak around them if you wish. Early on, someone claiming to be your father flies by and he tells you to get to the helipad. Dodging zombies along the way, you make your way to a beach when suddenly huge cargo containers start dropping from the sky and landing with a thud. The whole experience is definitely surreal, especially as Cliff engages in a dialogue with an ethereal female voice as he makes his way to the helipad. Oops, it's not your father who's demanding you fork over the USB drive with all the data you collected on the zombie outbreak, it's a weird new enemy boss with long claws and a weird spin attack. What's going on here? I have no idea, but I want to learn more. 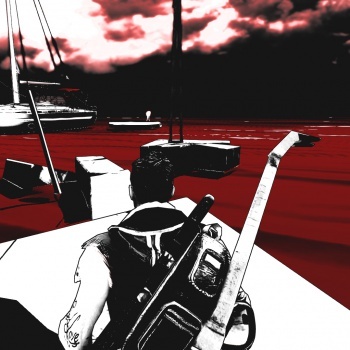 Check out Escape Dead Island when it drops on PS3, Xbox 360 and PC on November 18th.